NEW YORK (AP) — An explosion that destroyed a New York City home and killed a firefighter has drawn attention to marijuana-making methods that are legal in many states — but can also be lethal. 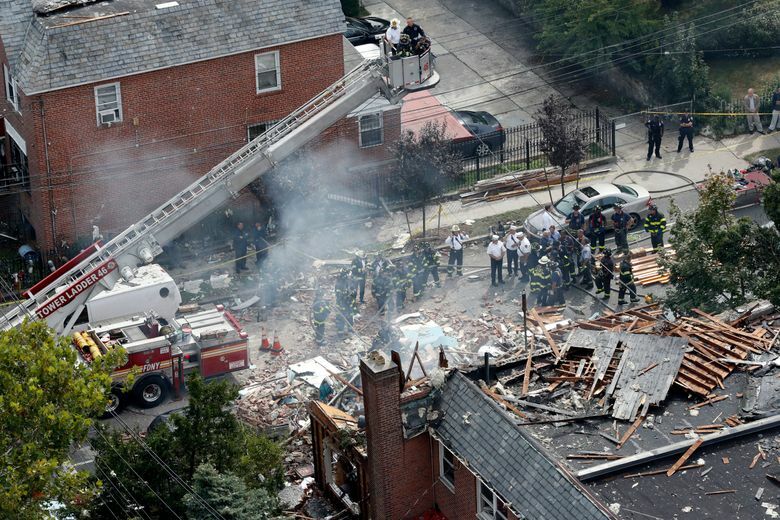 A New York fire battalion chief died responding to the blast Tuesday in a Bronx home that authorities say had been converted into an indoor marijuana farm. They’re investigating whether the alleged growers tampered with gas lines and mishandled other materials in ways that caused the explosion. Some growers rely on propane or butane gas because using large amounts of metered gas from a utility could draw the attention of authorities, who might question why so much fuel is needed for a house of a certain size, O’Hare said. In those conditions, a gas leak could spell disaster, he said. An hour before the explosion at about 7:30 a.m. on Tuesday in the Bronx, dozens of nearby residents said they could smell gas wafting over the neighborhood. The house had already been evacuated and fire personnel were on the scene when the blast sent debris flying, killing Chief Michael Fahy, a 17-year fire department veteran and father of three. His funeral was being held Saturday. Two suspects, Garivaldi Castillo and Julio Salcedo, were arrested and are being held on drug charges while authorities try to determine whether there is evidence they could result in more serious counts related to Fahy’s death. Prosecutors said in court this week that the two-story Bronx property was full of combustible items related to the pot operation, including grow lamps and vats of liquid fertilizer. Windows were sealed and other areas covered with extra insulation to retain heat. Plants the size of “small trees” were growing in bedrooms on the upper floor. A lawyer for the 32-year-old Castillo has questioned his connections to the house. Castillo has pleaded not guilty. Salcedo, 34, was arraigned late Friday, pleaded not guilty and is being held without bail. Firefighters packed the courthouse where Salcedo was arraigned. Earlier, as he walked into a Bronx precinct, some firefighters told him to “burn in hell,” The New York Daily News reported. Given that only about half of U.S. states have legalized marijuana, either for medical or recreational use, it’s impossible to estimate how many such growth labs exist, O’Hare said. In marijuana production-related accidents, more than 30 people were injured last year in Colorado from butane explosions involving hash oil — a concentrated form of marijuana extracted from the plant’s leaves and flowers. Last year, a marijuana dispensary in Santa Fe, New Mexico, was engulfed in flames after a blast that injured two workers. Fire department investigators said a butane leak met with an ignition source, causing an explosion powerful enough to separate the roof from the wall and melt fluorescent lights. And in Washington state, federal prosecutors have brought charges in five cases involving explosions during hash oil production. The former mayor of Bellevue, Washington, died while trying to escape a fire linked to such activity. In the past year or so, an especially strong concentrate is appearing — “shatter,” a form of cannabis wax derived from butane hash oil that is about five times more potent and faster-acting than unrefined smoked cannabis. It’s legal for recreational use in states such as Colorado and Washington, but sold in medical marijuana dispensaries in other states.